We are celebrating our awards last weekend at the Virginia Professional Photographers Association convention with a Special Event! It's our 4 for $40 Event! 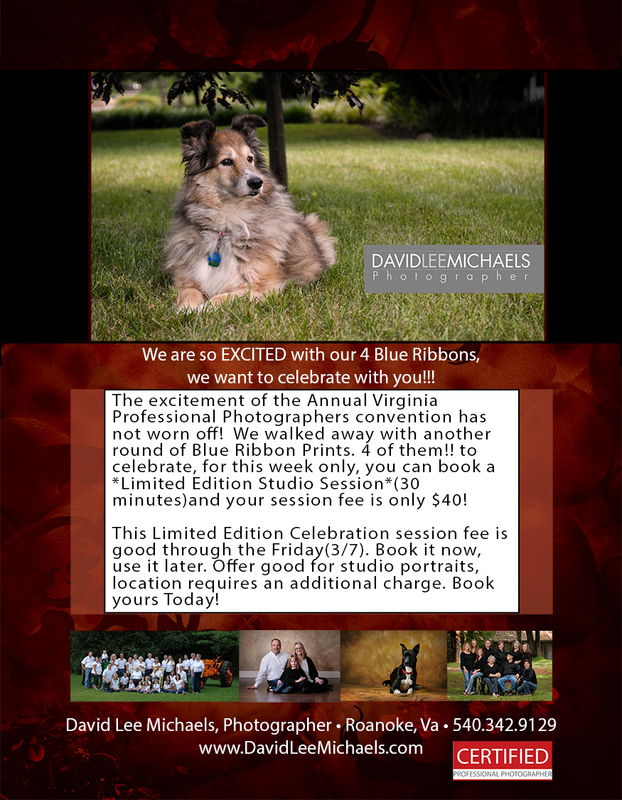 Last weekend we got 4 Blue Ribbons, so this week(all week long) we are celebrating by offering our "Limited Edition" Sessions for $40. That's a 30 minute session you can use for pet's or family sessions, and when you purchase it...you can use it anytime you like! Our Limited Edition Sessions are custom designed, and also include proofing in our viewing lounge. This Celebration will expire, this Friday March 7th. So purchase your session today and use it when you are ready. Call the studio at 540.342.9129, so you can get yours now.